~ Far East students dominate. There's a wide gender gap in math. On December 3rd, the Organization for Economic Co-operation and Development (O.E.C.D.) produced its triennial education report thorugh its Programme for International Student Assessment (P.I.S.A.). The O.E.C.D. is made up of 34 member-nations. But for this P.I.S.A. study, 65 economies/countries participated in the research. Over 510,000 students (15 years of age) from around the world took part in this 2012 study. ~ Top 25 performers out of 65 participating economies/countries. 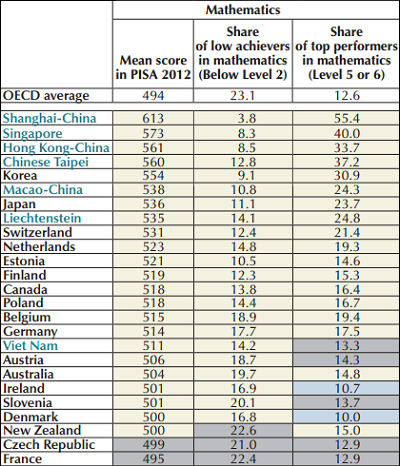 In mathematics, American 15-year-old students rank 36th in the world – below Russia and the Slovak Republic; and they rank 26th among the O.E.C.D. countries – that's in the bottom quarter of the list! Oddly, America on average spends more money on each student than most countries, ranking 5th in the world. So, what's going on? One theory is that while a small number of American kids are getting very, very expensive schooling, the vast majority are getting a very poor education. This means that the United States will be less and less able to compete in an ever-increasing science & math oriented world; at the same time, the wealth disparity between the rich and the poor will likely continue to widen to unprecedented levels within the U.S.
~ Does the U.S. have a "feel good" education system? But what's more troubling is the politicalization of education in the U.S. Creationists and Climate-Change deniers – often well funded by special interest groups and corporations – have made progress in undermining the teaching of Evolution and Global Warming in the classroom. Both "theories" are beyond reproach in science and are really not theories; but obfuscating and nonsensical controversies have been conjured up around them so as to damage their credibility. Sadly, when one part of science is undermined, other parts of science – if not all of science – also lose credibility. And as we said in our earlier article, "The 2nd 'Scopes Monkey Trial' Is Coming!" the United States is losing ground to countries like China because American politicians allow children to be the ideological battlefield for political purposes. ~ Creationists in Texas may influence textbooks all over the U.S.
Also, read our earlier article on how Creationists have infiltrated the education system of the United States: "Teaching Creationism Is Child Abuse." To put it bluntly, the reason why American students are falling behind is because some of their textbooks are filled with rubbish. ~ U.S. colleges struggle to keep up with new technical skills. (July 7, 2014) Read our recent article on the "vaccine truthers," click here.